This window( Fig. 2) will be displayed if you press the Delivery document button. In this window the button 'Import' will get the data from the last selected item from Stock. The button 'Add' inserts the item in the document( Max. 100 items per document.). The button 'Edit' send the document to GPE. The button 'Save' send the document to GPE and close it. Please ensure all is 100% OK !!! before you press this command. A last modification can be done on the document but the Stock adjustments will already be done. 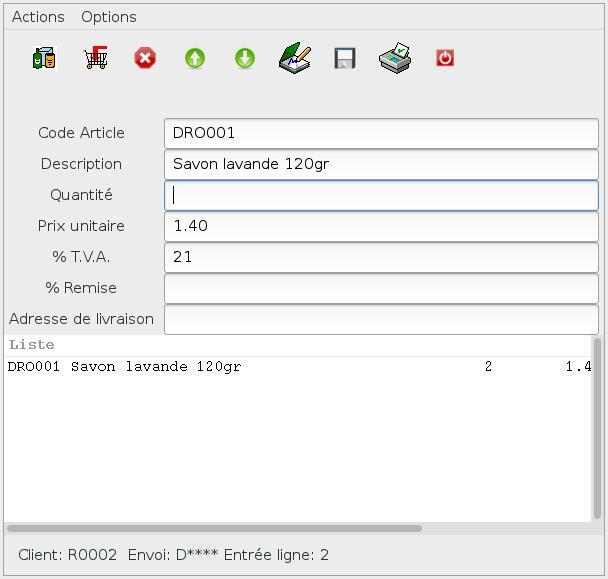 The button 'Invoice' produce an invoice document directly, an hidden delivery document is also created. Invoicing from all sale stations is possible but must be allowed from the master station in the network. Options Stock = Auto must be activated from the menu options if you like the stock updates to happen automatically. The flag '#' will then be set for the involved customer. You can navigate from entry to entry with the arrow buttons, you can't erase a line but modify it. From version 2.5.4 on, a barcode search can be activated from the Delivery window menu. A restart of the window is needed. Your barcode reader should emulate a keyboard seizure and give the same info as in the Stock Management. Once the barcode search is activated a beep is provided every three seconds and an automatic search in the data is performed. Here next, the layout of some documents. The addresses are printed at the position you will specified in the parameters menu of the core program. Each document/letter you will send to a party will receive the address printed in a place that should fit the transparent window of the mailing envelopes.